The advent of 3D TLC flash and high-speed interfaces such as USB 3.1 Gen 2 and Thunderbolt 3 has resulted in a number of economical high-performance direct-attached storage devices in the market. These are essentially SATA or PCIe SSDs behind a SATA - USB 3.1 Gen 2 bridge or a Thunderbolt 3 controller. SATA SSDs behind a USB bridge are budget-friendly. Yet, the performance is quite good for the average consumer workload (particularly those sporting a USB 3.1 Gen 2 bridge). The Seagate Fast SSD and the SanDisk Extreme Portable SSD are two such products targeting the mid-range consumer market. SanDisk / Western Digital has been an active participant in the high-performance external SSD market. The Extreme 500, 510, and 900 series external drives have had excellent market acceptance, and presented a credible alternative to the other external SSDs in the market such as the Samsung T1, T3, and T5 models. The SanDisk Extreme Portable SSD is their latest high-performance external storage device that builds upon the features of the Extreme 510, while addressing some of the minor issues related to the form-factor, connector placement, and thermal throttling. Seagate's flash-based product portfolio, on the other hand, has had a distinct enterprise focus, along with a few internal consumer SSDs. At the 2018 CES, they announced their first Seagate-branded high-performance external storage device, the Seagate Fast SSD. The SanDisk Extreme Portable SSD has the same gumstick form-factor as the WD My Passport SSD, thanks to the use of a M.2 2280 SSD internally. However, the casing is rugged, and the internal drive is protected well-enough for the device to carry an IP55 rating for water and dust-resistance. The 8.85mm x 49.55mm x 96.2mm device weighs just 39 grams. The product is bus-powered. Hence, the supplied material in the package is minimal. In order to ensure wider compatibility, SanDisk also supplies a small Type-C to Type-A adapter along with a 6in. Type-C to Type-C cable. Other than that, we have the usual warranty papers and quick start guide. The Seagate Fast SSD has a square form-factor, pointing to the use of a traditional 2.5" SSD board. The 9mm x 79mm x 94mm device weighs 82 grams. Like the SanDisk Extreme Portable SSD, the Fast SSD is also bus-powered. It comes with two 18in. cables - a Type-C to Type-C, and a Type-A to Type-A one. One of the interesting value-additions is the free two months of the Adobe Creative Cloud Photograpy Plan. 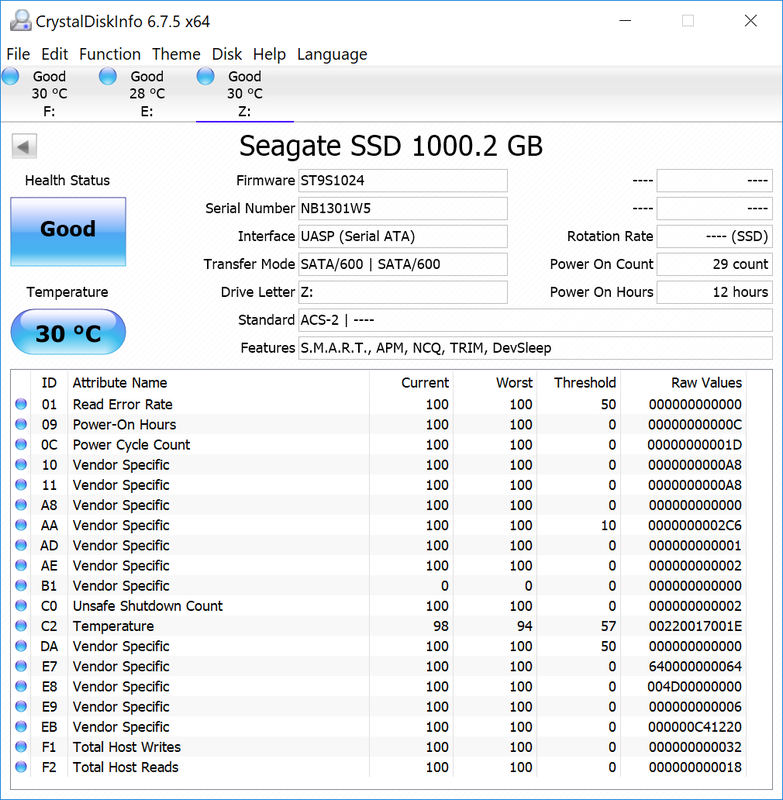 Prior to looking at the internals, CrystalDiskInfo provides some insights. Both drives support S.M.A.R.T and TRIM across the USB bridge. The WD My Passport SSD that we reviewed in June 2017 came with a SanDisk X400 (15nm TLC). The Extreme Portable SSD carries a WD Blue 3D NAND SSD (BiCS 64-layer 3D TLC flash) with the Marvell 88SS1074 SSD controller. We can clearly see the ASMedia ASM235CM acting as a SATA - USB 3.1 Gen 2 bridge chip. Both the main and daughterboards are single-sided and the only thermal protection is a single heat-spreading sticker over the flash packages, SSD controller, DRAM, and the bridge. The Seagate Fast SSD uses the same board as that of the Seagate BarraCuda SSD launched a few months back. It uses the Toshiba BiCS 64-layer 3D TLC too. The controller, despite the Seagate logo on the package, appears likely to be a re-branded Phison S10 (an educated guess based on the orientation of the controller with respect to the flash packages that we remember seeing in Phison's reference design). Our teardown shows extensive thermal protection aided by the metal parts of the enclosure. Similar to the SanDisk Extreme Portable SSD, the Fast SSD also has an ASMedia ASM235CM bridge chip on the board. The Seagate Fast SSD and the SanDisk Extreme Portable SSD both come with default volumes formatted in exFAT. We reformatted in NTFS for benchmarking purposes, and to ensure TRIM could get activated. The SanDisk Extreme Portable SSD comes with the SecureAccess software for password-protecting the drive. On the other hand, the Seagate Fast SSD comes with a link to download the Seagate Toolkit that can set up automatic backup and sync from select folders on the PC to the Fast SSD. Overall, the usage experience with the drives was largely similar. While the 18in dual-cable package from Seagate comes in handy for wider compatibility with different system setups, the SanDisk 6in. cable with a tag-on Type-C to Type-A adapter is more compact to use and carry around.